Carpal tunnel syndrome is a common condition where there is pain and impaired tactile sense of skin, some fingers, the palm of the hand and the wrist due to pressure on a nerve. The wrist is formed by two rows of small bones called the wrist bones or carpal bones. These form the basic structure of the hand and connecti the two forearm bones and the hand. The wrist bones are positioned in a way that, together with ligaments, they form a narrow channel through which among other things one of the nerves, the Median nerve, extends to the hand and fingers. This channel is called the Carpal tunnel. If the space in Carpal tunnel gets too tight, for example due to swelling, there will be pressure on the nerve, causing pain and sensory disturbances in the fingers (especially from finger 1 to 3), in the palm of the hand and the wrist. Sometimes the condition affects both hands. Pregnant women, due to swelling in the Carpal Tunnel. People with a rheumatic disorder, or who have had a fracture of the wrist which has resulted in narrowing of the above mentioned channel. Carpal Tunnel syndrome might arise from unknown causes. People with repetitive working movements of the wrist. 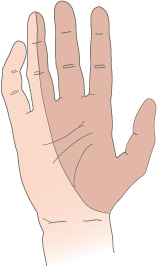 Tingling/stinging sensation in the thumb, index finger, middle finger and on the inside of the ring finger (all these are related to this specific nerve) and in the wrist region. At times, impaired function of certain muscles in the hand and pain all day. If, such symptoms persist for a longer period the doctor should be consult. By clinical examination, the doctor may either make a diagnosis or refer to a specialist who can carry out further investigations. I. Median nerve. II. Tight ligament. III. Other nerves. IV. Carpal bones. the tight ligament and the carpal bones. If Carpal Tunnel syndrome has occurred during pregnancy or other illness, the condition will often disappear when the pregnancy is over, or when the underlying disease is treated. When there is inflammation the treatment is typically anti inflammatory drugs such as Voltaren, Ibuprufen or similar products and even also injections with corticosteroid drugs . Besides, the wrist might be supported by a splint. If the condition persists the next step might be surgery to create more space in the Carpal tunnel. This is done by making an incision in the ligament that runs over Carpal tunnel. Depending on how long there has been compression on the nerve, the symptoms will gradually disappear and the result is usually good. The disease has a good prognosis if treated, and complications are relatively modest. Without treatment the condition might accelerate and result in complete numbness in the hand and reduced force when attempting to grab and hold objects. Similarly, the thumb muscles might slowly weaken if not kept active by the nerve.